May 11th 2014, Sunday, Mother’s Day – About to go on my longest boat ride ever. I was the junior crew – along with Captain Randy Sparks (Sailing instructor, charter captain, much international charter experience), Don Radcliffe (long time cruiser, 2 circumnavigations) and Graham Wright (starting sailing as a boy in England, never stopped). We left Santa Cruz early Sunday morning with our gear and all the food that Sherri had prepared for us in a rental car. For the last few weeks we had been watching weather windows come and go, wanting to be able to get past Point Conception and Point Sur all on the same trip. Finally a window had opened and hadn’t closed. We arrived at Channel Islands Harbor at mid-day but after unloading we still waited around until 4:30 so we wouldn’t get to Point Conception too early while the wind was too strong. Plenty of time to make sure the dockbox was empty, pull up my shore power cord and check out of Vintage Marina. We’ll miss that place, a really nice well run marina (and harbor). Outside the harbor big wind coming right down the coast, with 6-8 foot swell with really short periods. NOT comfortable. Randy and Don went forward to raise the main (double reefed) for stability. Hanging on as they worked the main, they discovered that I had rigged the reefing line all wrong. Great time to find out. But these guys fixed it! While Pablo was see sawing up and down the chop, water pouring over the dock. These conditions held for about 3 hours. The whole time I’m thinking “Is it going to be like this for the entire trip?? ?” You know, it could have been. But it wasn’t. After passing Santa Barbara things calmed down considerably, but never really got “smooth” until the end of the trip. We were able to use the autopilot for the remainder of the journey. It was getting on towards evening. The other guys ate some of the KFC chicken we had picked up in Oxnard, but I couldn’t eat. I wasn’t sick, I just didn’t have any desire to eat. I drew the best watches (I think) 9 – 11 at night, 5 – 7 in the morning, dawn. As the sun went down the oil rigs lit up, they DO look like Christmas Trees. The iPad/GPS/AIS/WiFi router system all worked correctly, but occasionally the iPad lost the router signal (briefly) causing false AIS alarms. Very annoying. It only seems to happen with the iPad 2, but not with the newer iPad Air. Needs to be investigated. We ended up only using the iPad Air, but I need to have both functional in the future. It was really nice to see our “own ship” location on the chart as well as the shore, oil rigs, and the AIS targets (other ships). When Graham went below at 9:00PM I was on watch by myself. The lights from shore on starboard, oil rigs to port, and a few ships on the horizon. It wasn’t nearly as cold as I thought it would be. We were in a good weather window. The watch went faster than I thought it would, and I even made some minor course corrections to keep us evenly between the rigs and the shore, and a wide margin from other vessels. Randy came up at 11, and I was wondering if I’d be able to sleep. We were still seesawing heavily, and I was up in the V-berth, with a lot of vertical motion. While I was wondering if I could sleep, I did. At least half the time anyway. Graham woke me for my 5 AM watch – told me I’d get to watch the sunrise over Point Conception. It was beautiful! And again, not nearly as cold as I had expected. No ships in sight. As the day became brighter we went by Point Arguello, also beautiful. The winds were still on the nose, but not very strong, swell moved the boat but not too bad. It could have been SO much worse. Sunny day Monday motoring north, with the constant droning of the engine, the continual seesawing of the boat. Finally by the afternoon, I actually felt like eating something. Really nice view of the launch facilities at Vandenberg Air Force Base. When we saw Avila Bay we knew we were close to Morro Bay which would be the last chance to get fuel before the long harborless (is that a word?) stretch to Monterey. We checked the fuel, and it showed we had enough to go the whole way. Sherri’s dinners were great. Some of us had stew, some spaghetti and meatsauce. All delicious, not to mention the cookies, brownies and everything else she packed. Thank you my love. My Monday night 9 PM watch was just past Morro Bay, and things really started kicking up. Much more wind on the news and much higher seas with them. Our average speed dropped from 5 ½ Knots to 3 ½. Pablo didn’t mind at all. Just powered up the wave, and splashed down the other side, water flying to port and starboard off the bow. Me? I just held on. At one point hit with a very strong smell of sewage – my first thought was that the holding tank had done a bad thing. I stuck my head down into the cabin and happily it wasn’t coming from there. We were several miles from shore, so perhaps a passing ship had dumped their tank. The entire 2 hours was rough going. When Randy got up for his watch, I overheard him discussing with Don the possibility of turning around and going in to Morro Bay. I went to my bunk not knowing where I would be when I got up. During my 6 hour sleep shift I awoke and we seemed to be going MUCH smoother. I assumed we were motoring in to Morro Bay, and fell back asleep. At 5 AM Graham came to get me. I asked where we were, and he said “…almost to Point Sur – you have another good sunrise coming up.” Up on deck I looked at the chart plotter and we had come a LONG way. He said that after my watch things calmed down considerably and we had made good time. Another beautiful sunrise, this time over Point Sur. Once again, like at Point Conception, there was wind and swell coming right at us, but no whitecaps, not very cold, and we moved right along. Tuesday became warm and sunny. As we approached Monterey I realized that we would be in today. I was totally shocked, I NEVER expected to do the trip in 2 days. I texted Sherri giving her our ETA. Past Stillwater Cove, it was actually HOT with no wind. I had not brought a single T shirt with me. Around Point Piños, I could see the stacks at Moss Landing. A couple of hours later, and I was waving to Sherri – who was there on Moss Landing Harbor beach waiting for us. 47 hours – way faster then I expected. 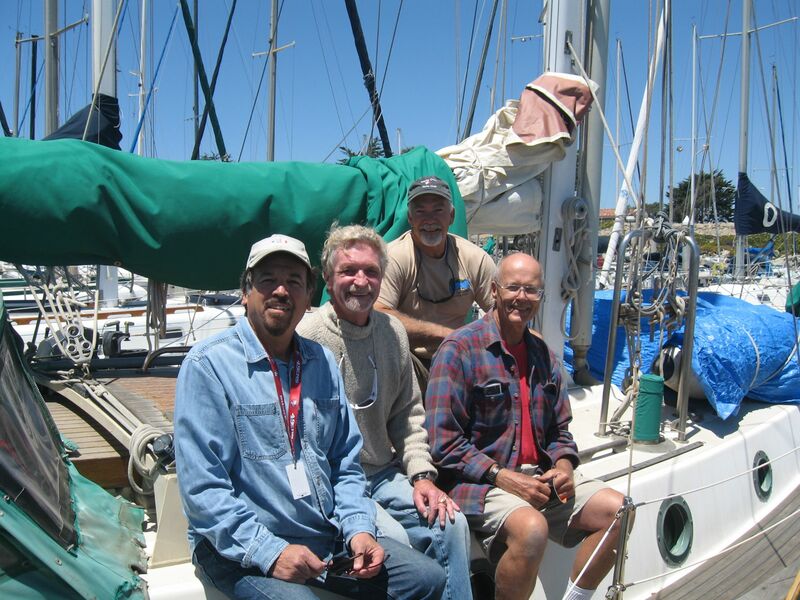 I learned so much from these guys, up to and including docking the boat in Moss Landing Harbor. What a ride. And the adventure is only beginning. This entry was posted in Uncategorized and tagged Channel Islands, Getting ready, Learning, Moss Landing, Sailing peeps. Bookmark the permalink. Congrats on a great passage, with a little learning thrown in just for fun!